The real motivation for Trump’s immigration policies is racism. Never forget it. 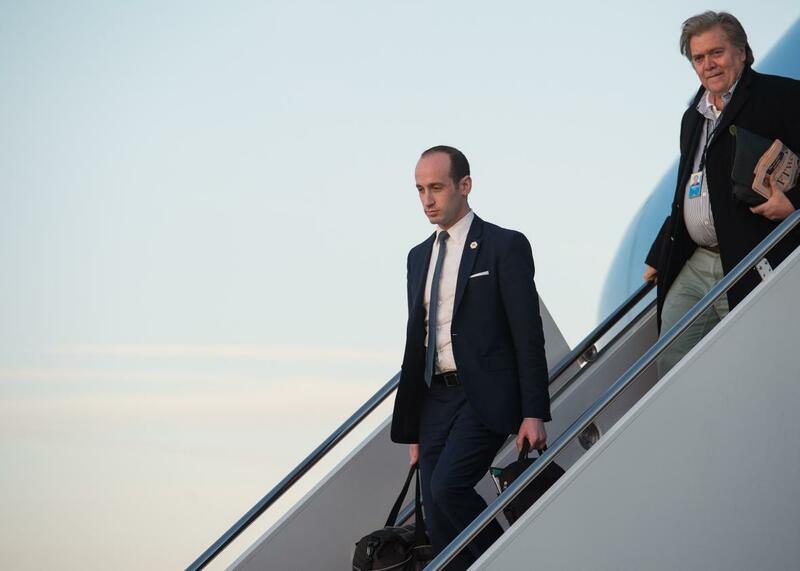 Senior White House advisers Stephen Miller (L) and Steve Bannon step off Air Force One at Andrews Air Force Base in Maryland, on Sunday. On Monday, sans the usual gaggle of reporters and photographers, President Trump signed a revised and somewhat downsized version of his now-infamous refugee and travel ban, commonly called the “Muslim ban.” The changes to the original order are substantial. Iraq is no longer on the list of restricted points of origin, and the administration also makes clear that legal permanent residents and current visa holders are not blocked under the new version. It does bar all refugees from entering the United States for next 120 days, lower the cap for refugee admissions to 50,000 from 110,000, and drop a provision that gave refugee priority to “minority religions in the individual’s country of nationality”—promoted as a carve out for Christians and considered to be one of the least constitutional parts of the measure. As my colleague Dahlia Lithwick notes, however, serious problems remain: Like its predecessor, the revised order provides no rationale for barring people from Syria, Iran, Libya, Somalia, Sudan, and Yemen, the six Muslim-majority nations still subject to the travel ban. On Monday, in a news conference, Attorney General Jeff Sessions confirmed a report that “more than 300” FBI domestic terrorism cases involve persons admitted to the United States as refugees. But there’s no proof—and the administration provides no evidence—that those suspects came from the listed countries, or that those cases actually resulted in convictions or actual crimes. Indeed, the claim—an integral part of the revised executive order—runs counter to an analysis from the Department of Homeland Security, which found that few people from the listed countries have been involved in terrorism once on American soil. And those that have were radicalized years after arriving. Absent an army of precogs, screening has limited utility. The terms of the new ban may prevent a repeat of the tragic—and for the administration, embarrassing—scenes that greeted the original order: legal residents being turned back at airports, parents separated from children, innocent travelers detained and deported for no reason at all. But what it doesn’t do is protect Americans from any particular threats. If you assume the travel order is meant to prevent terrorism, then it’s still a solution in search of a problem. But there’s another way to view the measure: As the centerpiece of an agenda rooted in the Manichean racial views of its key architects, Stephen Miller and Stephen Bannon. Both Miller and Bannon are clear on their vision for the United States and open about their view of the status quo. In the wake of the first travel ban, the Los Angeles Times reported that both men viewed the president’s anti-immigration measures as a means to combat increasing numbers of “foreign-born residents” from non-European (read white) nations. A native of California, Miller has long argued against Hispanic immigration as a force that undermines the social and cultural fabric of the country, defined implicitly as white, and explicitly as “Judeo-Christian.” His view of Islam is, and has been, similarly stark. “We have all heard about how peaceful and benign the Islamic religion is, but no matter how many times you say that, it cannot change the fact that millions of radical Muslims would celebrate your death for the simple reason that you are Christian, Jewish or American,” he wrote as a high school student in the early 2000s. The book, similar to the white-supremacist tract “The Turner Diaries” in its depiction of a brutal race war, reads as a warning and call to arms for white Europeans (and presumably white Americans), condemned as dithering and feckless for not killing the migrants when they had the chance. If this is where the architects of the travel ban stand, then there’s no mystery to the actual motivation for the order. Not terrorism, for which refugees and travelers from these countries aren’t a serious vector in the United States, but ethno-nationalism. The travel ban, like the sudden explosion of deportation—wielded indiscriminately against all undocumented immigrants, “bad hombres” or otherwise—is one piece in a larger effort to reshape the demographics of the country through force. To single out those who belong and those who—according to Trump and his backers—do not. To “make America great again” by making it white again, or more accurately, raising the political premium of whiteness. As we navigate the corruption, dysfunction, conspiracy mongering, and outright attacks on the function of government, we should be careful never to forget that what we also face in the Trump administration is white-nationalist radicalism, eager to turn back the clock on pluralism and multiracial democracy. Whether or not the courts determine this latest Muslim ban ultimately passes constitutional muster, those facts will not change.